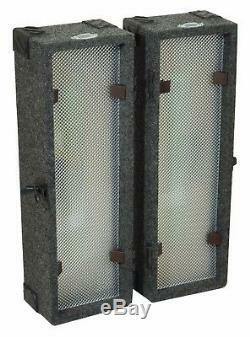 The clip-together retro style LED Light Box has 4 ultra bright LED's per side and a built in sound-to-light controller. 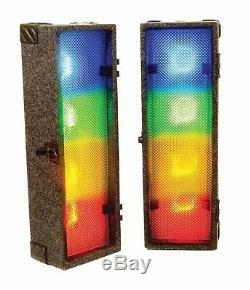 The light box boasts 8 high intensity long-life coloured LED's (2 x Red, 2 x Amber, 2 x Green and 2 x Blue). 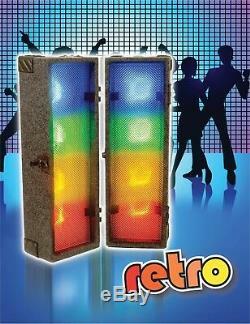 Featuring controls for sound level and chase speed with prismatic screens to diffuse the light and give a retro disco look. The LED Light Box needs just a connection to the mains to work out of the box and provides a varied and interesting none smoke based effect. 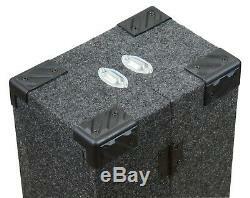 Finished for durability in a tough, rugged carpet covering with plastic corners, metal hinges and a sturdy catch. The two sides clip together after use for safe and easy transportation. Retro style LED Light Box. 4 ultra bright LEDs per side. Net weight (kg): 6.5. Colours Produced: Red, Amber, Green & Blue. Control Style: Sound to Light. You will need to pay for the cost of returning the item(s) and the item(s) remain your responsibility until we receive them. The item "FXLab 2 x 4 Way Retro Disco Performance Lights Stage DJ Club Event LED Light Box" is in sale since Thursday, November 9, 2017. This item is in the category "Sound & Vision\Performance & DJ Equipment\Stage Lighting & Effects\Stage Lighting Single Units". The seller is "healthysounds" and is located in Runcorn. This item can be shipped worldwide.